I've said before that Spider-Man 2 is my favourite superhero film of all time, though I still sometimes find myself struggling to choose between it and Batman Begins, The Dark Knight, or Iron Man. Either way, most won't deny that this second entry to the trilogy certainly improved upon the already superb original and ranks as one of the best films of it's genre, something largely influenced by an exceptional performance by Alfred Molina as classic Spidey foe Doctor Octopus. Perhaps the most commonly addressed plot hole in the film is Doc Ock's strange invincibility to Spider-Man's punches; as well know, Doc Ock is not a superhuman. His arms possess incredible strength and flexibility, and their corrupt AI manipulates him into vicious actions, but that doesn't render his body strength on par with that of Spider-Man. But not only are Spider-Man's punches not tearing Doc Ock's head off, or at least giving him nasty bruises, but he is also seen smashing out windows and slamming into cars, falling off an uber high tower and crashing onto a speed train, and even being electrocuted on two occasions - yet still surviving such trauma without a single injury. People usually counter this debate with how Spidey pulls punches to avoid killing his foes - however, you'd assume that if he was punching Doc Ock constantly, that he'd at least being doing so to knock him out, which wouldn't be a tricky task. If not, why does he keep punching him? To wow the audience with his killer moves? This argument also doesn't explain Doc Ock's apparent invincibility to all the other aforementioned trauma he sustains. One of many key reasons Doc Ock is so successful in his public attacks is because the police, as is the case with most superhero films, and overly tolerable idiots. A violent, armed thug would perhaps be told to freeze at gunpoint, with a chance to drop their weapon and be arrested without harm, but I'm sure if a mad scientist attached to indestructible metal tentacles crashed out of a bank and began wreaking havoc in the streets, the police may find it a good idea to shoot without any warning - he's a cyborg-esque monster for goodness sake. When they do decide to shoot once Doc Ock is halfway up a huge building, every shot seems to miss when he's not really moving that quick, and even when he only goes around the corner, the old bill still make no compulsive effort to pursue him further. Wise. Not a lot of people seem to care about Doc Ock's tentacles when he unveils them to his audience. Yes, the main event was his fusion reactor project, but creating such tentacles alone would certainly wow the crowd more than some efficient energy generator and render him rich and famous beyond all measure. But it seems to be dismissed as an average creation that many have seen before. Also, why do his tentacles have huge spikes inside them to be clearly used as a weapon? Perhaps he fitted them when reviving his fusion project, but he has it whilst robbing the bank, when he was penniless and homeless. What was it required for if fitted when he first built the damn things? The film seems to pick and choose what powers Peter loses with no clear definition - Peter tests his abilities by leaping off a building, hoping his spider powers have returned, but his poor stretch and acrobatic...uh, ness, leave him soaring to his death as he slams onto the cars below. Oh no...he survives with a broken back. Or a small weird clicking back injury that is never once referenced again. So I guess all his powers have failed bar his superhuman strength? Hmmm. Doc Ock notably tosses a taxi at Peter and Mary Jane as they meet in the café for an emotional conversation - now it's never made clear if this was deliberate or if it was just collateral damage from the chaos he was causing outside, but before rushing into such actions maybe Doc Ock should've considered that certainly almost killing someone isn't the best way to interrogate them. Yes, Peter's Spider Sense kicked in and allowed him to dodge the danger with perfect timing, but Doc Ock is unaware that Peter is Spider-Man and so couldn't possibly have deduced that such a thing would happen. Adding to this, what certainly is deliberate is Doc Ock tossing Peter into a brick wall and allowing heaps of rubble to violently crush him. Once again, Ock does not know Peter possesses superhuman strength; consequently, for all he knows, such actions certainly could've killed or even seriously injured Peter, preventing him from seeking Spider-Man as Doc Ock requested. For a scientist of such intellectual magnificence, he doesn't seem to boast much common sense. 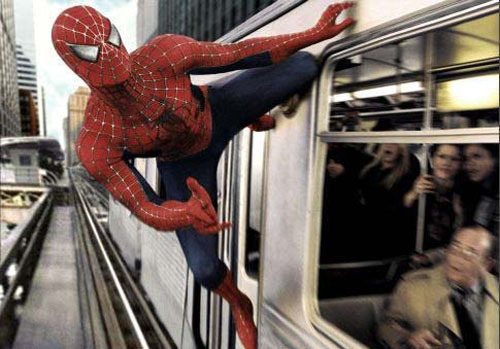 When Spidey and Doc Ock plummet from the clock tower and crash onto the train, the passengers are clearly alerted to the chaos around them not only by the noise but also when Spidey himself is thrown into the train during the scuffle. So why was the driver never alerted and the train never stopped? It's a commonly mentioned plot hole when discussing Skyfall's opening scene, but nobody seems to care about it here. Why does it take so long for Ock's second fusion reactor to start absorbing the metal building around it? It may only attract small objects at first, but is then seen pulling in cars among other things from miles away - yet conveniently only destroys the building as the set piece comes to a conclusion. This movie is still awesome.